This worksheet help users to understand the relationship between the standard deviation and standard error. 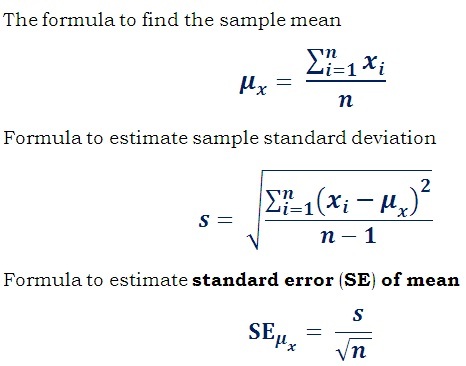 The step by step calculation for for calculating standard deviation from standard error illustrates how the values are being exchanged and used in the formula to find the standard deviation. In the theory of statistics and probability for data analysis, standard deviation is a widely used method to measure the variability or dispersion value or to estimate the degree of dispersion of the individual data of sample population. In the theory of statistics and probability for data analysis, Standard Error is the term used in statistics to estimate the sample mean dispersion from the population mean. The below solved example problem illustrates how to calculate standard deviation from standard error. For the set of 9 inputs, the standard error is 20.31 then what is the value standard deviation? For more information for dispersion value estimation, go to how to estimate sample & population standard deviation.